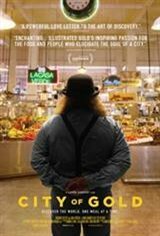 In this richly penetrating documentary odyssey, Pulitzer Prize-winning food critic Jonathan Gold shows us a Los Angeles where ethnic cooking is a kaleidoscopic portal to the mysteries of an unwieldy city and the soul of America.Combing through colorful neighborhoods in his green pickup truck, Gold is sniffing out his next strip-mall discovery-whether Oaxacan grasshopper soup, hand-cut tonkotsu ramen, or a particularly unctuous pad see ew. As piping-hot platters are served up, so are stories of immigrants whose secret family recipes are like sacred offerings pledged for the opportunity to build their American Dream. With eternal curiosity, razor-sharp intellect, and existential longing, Gold is a culinary geographer taking us where no critic has gone before.